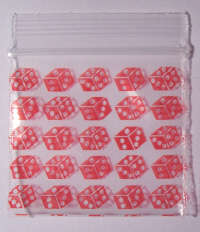 "Different Printed Baggies" are for the Baggie Collectors. They are of "Different DESIGNS" & of "Limited Availability" , Odds n' Ends, for the Baggie enthusiast. They come in various sizes. All sizes are Width(opening) x Height. * Every "Different Printed Baggie" design may not be available in every size. It's wise to select a second and third choice just in case.